St. Martin's Press, 9781250128867, 320pp. The dramatic story of the explosive 1894 clash of industry, labor, and government that shook the nation and marked a turning point for America. 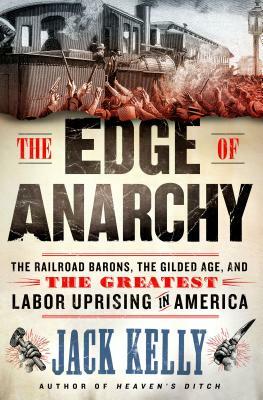 The Edge of Anarchy by Jack Kelly offers a vivid account of the greatest uprising of working people in American history. At the pinnacle of the Gilded Age, a boycott of Pullman sleeping cars by hundreds of thousands of railroad employees brought commerce to a standstill across much of the country. Famine threatened, riots broke out along the rail lines. Soon the U.S. Army was on the march and gunfire rang from the streets of major cities. Many of the themes of The Edge of Anarchy could be taken from today’s headlines—upheaval in America’s industrial heartland, wage stagnation, breakneck technological change, and festering conflict over race, immigration, and inequality. With the country now in a New Gilded Age, this look back at the violent conflict of an earlier era offers illuminating perspectives along with a breathtaking story of a nation on the edge. JACK KELLY is a journalist, novelist, and historian, whose books include Band of Giants, which received the DAR's History Award Medal. He has contributed to national periodicals including The Wall Street Journal and is a New York Foundation for the Arts fellow. He has appeared on The History Channel and interviewed on National Public Radio. He grew up in a town in the canal corridor adjacent to Palmyra, Joseph Smith's home. He lives in New York's Hudson Valley.